On the eve of the second anniversary of the sinking of Costa Concordia, the salvagers held a press conference this morning in Rome to discuss the progress that is being made toward removing the ship next summer from Giglio Island. One of the most interesting parts of the presentation was the updated look at the ship since it has been righted. The most fascinating views came from video which was shot remotely by drones as they flew around the outside of the vessel. Costa Concordia's port side. Eleven sponsons are attached, but under the waterline. Costa Concordia's port side looking forward. Note the crane that has been built in the center of the ship. Costa Concordia's starboard side looking aft. Note the damage where the ship was resting on this side. The crane was built in the center of the ship to assist with attaching the sponsons to the sides of the ship. 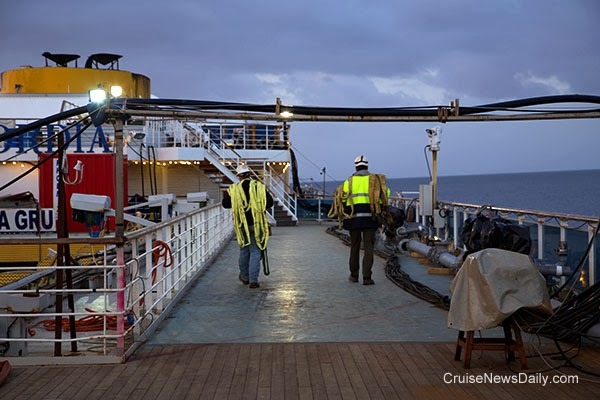 A workforce of up to 500 people has been working around the clock on the ship since the day after Costa Concordia sank. 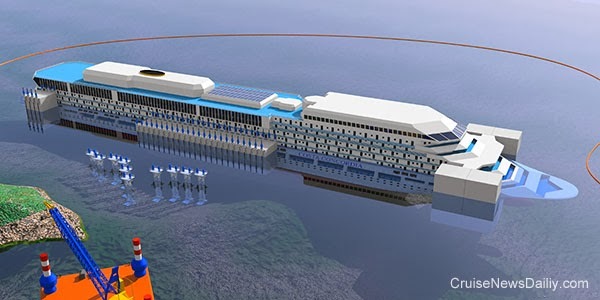 Rendering of Costa Concordia when sponsons have been attached to both sides and it is ready to be refloated. 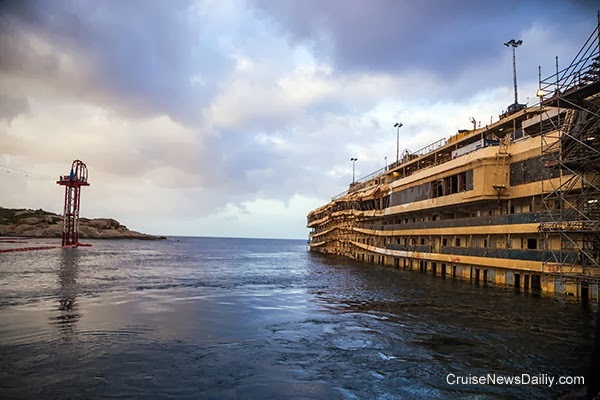 The complete article appeared in the January 10 edition of Cruise News Daily. 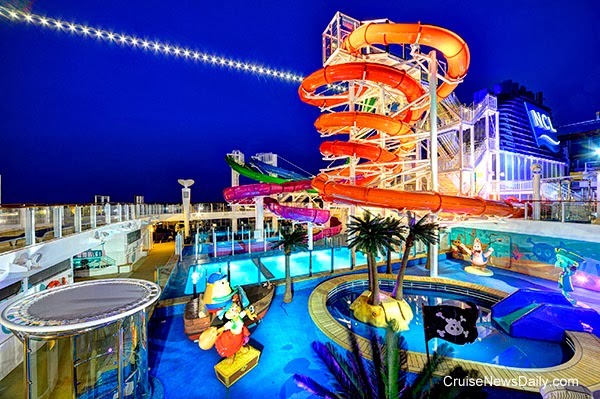 Photos and video copyright Costa Crociere and Cruise News Daily. May not be copied or used without permission. All rights reserved. 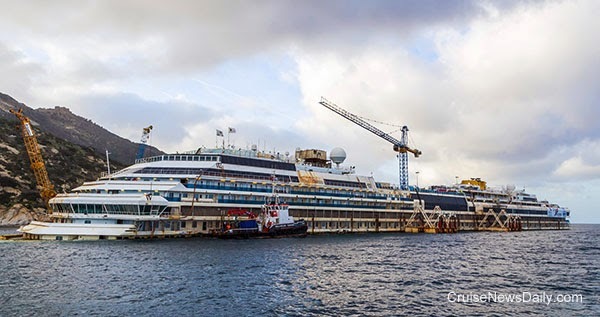 Last Friday (January 10, 2014) Costa Crociere and Titan-Micoperi held a press conference in Rome to update the status of the removal of the wreck of Costa Concordia. This is part of the information distributed there. The removal of the wreck of the Concordia is an extremely complex technical engineering feat – considered the most daunting salvage ever attempted on a ship of its size – with the deployment of the finest international expertise, state-of-the-art technology and unprecedented financial resources. The priorities of the project were clear from the outset: respect for the environment, workplace safety and protection of Isola del Giglio’s socio-economic fabric. Cost considerations played no part whatsoever in the decision-making process. The world’s best cutting-edge technical solutions were chosen even though this led to a significant increase in outlay. According to current estimates, the total cost of the salvage exceeds 600 million euros. The size of this investment gives a good idea of the scale of the project, although not one cent of public money is being spent. Activity at the site has continued nonstop: about 500 salvage operators worked round the clock in shifts, 24/7, during the preparations for parbuckling; around 200 technicians will be involved in the work leading up to the refloating operation. The first step was defueling, also known as “debunkering”, which was vital in terms of protection of the marine ecosystem. For this operation Costa Crociere commissioned the world’s leading salvage experts Smit Salvage BV, who in turn worked with the talian firm Tito Neri srl. Preliminary work began at the end of January 2012 while the actual pumping out of the oil began on February 12, 2012 and ended on March 24, 2012. A total of 2042.5 m3 of fuel was removed from the ship. This extremely complex and delicate operation was completed successfully without any discharge into the sea. On January 14, 2012 the recovery of material floating on the surface began, conducted initially by the emergency services and subsequently by Costa Crociere. On March 13, 2012 the operation to remove the sewage ended, Smit Salvage BV and Tito Neri having recovered a total of 240 m3. At the end of the debunkering, on 25 March 25, 2012, the recovery of material deposited on the sea bed started: in total 24 tons. On April 21, 2012 Costa Crociere announced that, after reviewing the bids of the six finalists, it had awarded the tender for the contract to remove the ship in one piece to the international marine salvage consortium Titan-Micoperi Srl, a joint venture between Titan Salvage, a U.S. company owned by Crowley Maritime Group and a world leader in the recovery of wrecks, and Micoperi, an Italian company specializing in engineering and installation of offshore structures and undersea pipelines. The winning recovery project was chosen based on stringent criteria, 90% of which referred to environmental protection, safety and the socio-economic fabric of the island community. That cost was not a key factor is underlined by the fact that the successful bid was actually the most expensive of the six submitted. The wreck removal project includes contributions from some of the world’s top technical engineering experts, notably leading international naval and offshore engineering, architecture and design firms such as Ceccarelli Yacht Design, Studio Tecon of Milan, Spline of Venice, Overdick of Hamburg and the Dutch underwater solutions provider Disa International. There have also been contributions from consultants such as RINA (Italian Shipping Register), D’Appolonia and Rome’s Università La Sapienza. All the work involved is being performed by industry leaders like the Italian companies Fincantieri, Cimolai, Rosetti, Trevi, Fagioli and Nuova Olmec, Gas & Heat and the British enterprises Furgo Seacore and FoundOcean. The companies charged with underwater drilling and engineering are global players in their segment and have worked for large oil and energy corporations. Work on the removal of the wreck from Isola del Giglio began at the end of May 2012 following approval by the Service Conference convened by the Italian Government Emergency Commissioner Franco Gabrielli. The salvage plan can be divided into 5 phases. In November 2012 the anchoring and stabilization of the wreck were completed, thus preventing the ship from slipping or falling off the steep spurs of rock on which it was perched at either end and enabling the subsequent work to be carried out safely, even in adverse sea and weather conditions. Stabilization was carried out by securing four anchor blocks to the sea bottom between the center of the wreck and the coast. Later, seven more anchor blocks and 11 towers were installed, for use during rotation of the ship into an upright position, the so-called “parbuckling,"
On top of each tower are two strand jacks with a hydraulic mechanism for pulling cables, individually controlled via computer. Each strand jack operated a cable connected to a steel chain (each link of which weighs 205 kg) going underneath the wreck so that it could be attached to the offshore side of ship. This system was used to offset the forces bearing on the hull during rotation and guarantee that it could be turned to a vertical position. The second phase, completed in summer 2013, was one of the most complex. The preparation of the false sea bed on which the ship came to rest once it had rotated required a great deal of effort, much of which was contributed by a team of around 120 divers. The false sea bottom consists of grout bags (containing a total of 12,000 m3 of cement) and six steel platforms (three large ones [35 x 40 meters] and three smaller ones [15 x 5 meters]). The grout bags were used to fill the gap because, as already mentioned, the ship was lying on two underwater reefs with a valley in between. The grout bags have eyelets for easy removal during clean-up operations. The subsea platforms provide a stable base for the upright vessel. The platforms are supported by pillars attached to the granite sea bed; these were put in place by drilling (21 holes 2 meters in diameter and an average of 9 meters deep) using a closed-circuit system so as not to leave any debris in the sea. During this phase, 11 large tanks – known as “sponsons” – were welded to the side of the hull above water. They were used during the parbuckling to provide leverage and will subsequently provide buoyancy needed for refloating. 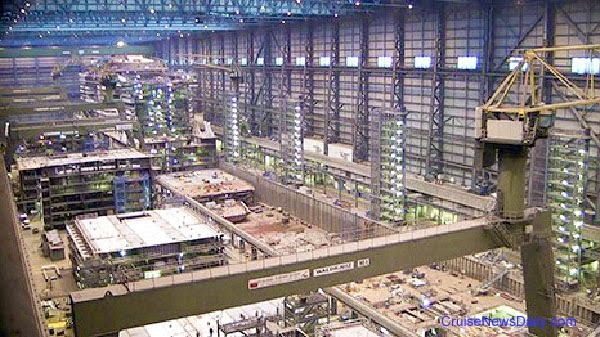 These large metal boxes, built by Fincantieri, are of considerable size: 10.5 m x 11.5 m with height of 21.8 m or 33 meters, respectively the equivalent of a 7-storey or an 11-storey building. In addition, two “blister tanks” were attached to the bow of the wreck; again built by Fincantieri, these massive tanks provided around 4500 tons of buoyancy, stabilizing the whole bow and acting rather like a neck brace. Another four sponsons are still to be installed on the port side, making a total of 15 in all on that side, plus 15 on the starboard side. The actual parbuckling itself – the uprighting of the ship – began on September 16 and was completed the following day at the end of an unprecedented operation lasting 19 hours. The strand jacks were used to pull the steel cables attached at one end to the nine central sponsons and at the other to the underwater platforms, thereby applying a load of over 6,500 tonnes so as to rotate the vessel 65° back into an upright position. Since it was raised, the wreck has been resting on the false sea bed at a depth of about 30 meters. After the parbuckling, in order to guarantee additional stability for the wreck also in the unlikely event of extremely adverse weather conditions during the winter season, so-called “winterization” measures were implemented with systems designed to further improve the stability of the hull on the platforms. More specifically, these measures comprised the positioning of 28 tubular steel braces connecting the sponsons on the wreck to the underwater platforms on the offshore side, the positioning of additional grout bags on the inshore side and the installation of an additional holdback system for the bow. Following the parbuckling, the wreck was surveyed to assess its overall condition, particularly the starboard side, which was previously submerged and inaccessible. Following this assessment, the engineers determined the structural repairs required ahead of the installation of the 15 sponsons on the starboard (inshore) side. This meant it was easier to make a reliable forecast as to when the ship would be refloated and removed from the island. The installation of the sponsons is planned to start in April 2014. The 15 sponsons to be fitted on the starboard side have already been built and are being prepared for installation in the Titan Micoperi Terminal in Livorno. Another four sponsons are still to be installed on the port side, making a total of 15 on this side as well. Initially, the 30 sponsons on either side of the vessel will be filled with water. A pneumatic system will be used to empty the water gradually, thus providing sufficient buoyancy for flotation. It is a delicate operation and engineers estimate that it might take several days. Upon completion of this process, a portion of the hull of about 18.5 meters will remain submerged. After refloating, the wreck will be ready for transportation to its final port of destination for dismantling and recycling. Installation of an additional holdback system for the bow. A crane was installed on the highest deck of the wreck and is used to maneuver materials needed for the operations. The wreck is constantly monitored by sensors transmitting data 24/7 to check in real time for any movement. The last minor movements were recorded in the 15 days following the parbuckling – a sign that the wreck was settling in its current position on the false seabed. Since then, no significant movement has been detected. The wreck is also monitored 24/7 for security reasons by a video surveillance system with 41 cameras checking key areas. In Titan Micoperi Terminal in Livorno operations are in progress to complete the outfitting of the 15 sponsons to be installed on the starboard side, and the remaining 4 to be installed on the port side to combine with the 11 that were already installed for the parbuckling, making a total of 30 needed for the refloating phase. The 19 sponsons will be integrated with the necessary strand-jacks and ballast control systems and transported to Giglio Island in a vertical position to allow immediate installation and time optimization. 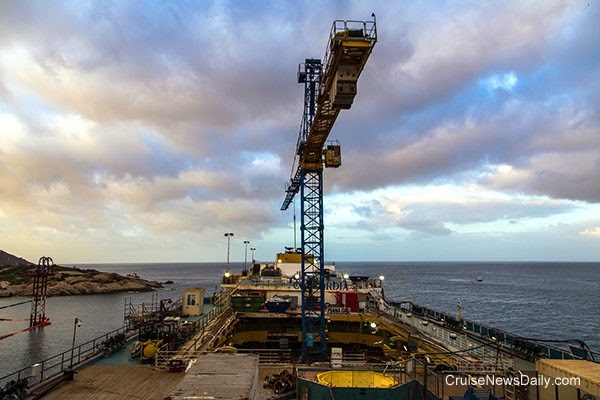 After the successful parbuckling that took place on September 17, 2013, the next objective is now the refloating of the Concordia so that it will be ready for transportation. correspondence with the damaged areas (before parbuckling the wreck had been lying on two spurs of rocks) to allow the sponsons to be properly aligned through the positioning of steel plates. 2. Installation of the 15 starboard sponsons and the remaining 4 on the port side. 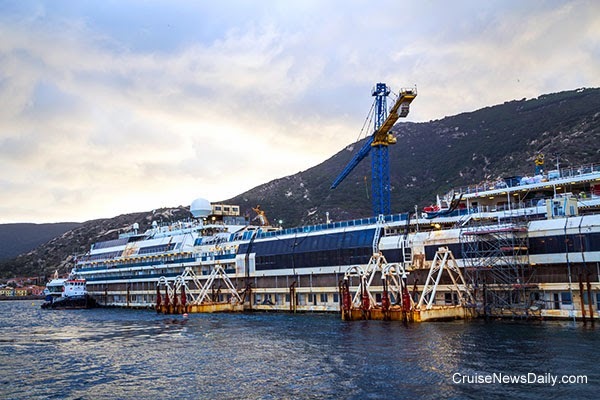 The sponsons are already built and are being prepared in the Fincantieri shipyard in Genoa and the Titan Micoperi Terminal in Livorno for transportation to Giglio Island. They are being integrated with the necessary strand-jacks and the electrical/pneumatic systems (ballast control systems) and will be transported to Giglio Island in a vertical position to allow immediate installation and time optimization. The 15 sponsons will be installed on the starboard side of the ship in a symmetrical position to the sponsons fitted on the port side. The first two starboard sponsons will be tied with hooks to the two blister tanks already positioned on the bow, while the others will be maintained in position with steel chains (56) and cables (36) that pass under the keel of the ship. Each sponson will be connected to each cable/chain with a strand jack (92 in total) positioned on the sponson to keep it in a vertical position. The remaining 4 sponsons to be installed on the port side will be positioned using hooks that have already been fitted. These operations are weather sensitive and require favorable sea conditions; for this reason, they have been planned for spring 2014: installation of the 19 sponsons is planned to start by April 2014. Initially, the 30 sponsons will be full of water. A pneumatic system will be used to empty the water gradually from the sponsons on both sides of the wreck, thus providing sufficient buoyancy for flotation. On completion of the emptying process, a portion of the hull of about 18.5 meters will remain submerged. The refloating will begin by emptying the sponsons of water gradually to make sure the ship’s movements are homogeneous throughout its length. This will be done using a software system with sensors installed on both sides of the wreck providing information to assess the behavior of the ship and suggest the appropriate variations in ballast control. Refloating will be completed when the maximum possible quantity of water has been discharged from the sponsons and the ship is upright and as parallel to sea level as possible. It is a delicate operation and engineers estimate that the it might take up to a week for the process to be completed. After refloating, the wreck will be ready for transportation, based on the authorizations required by the law, to its final port of destination, which is yet to be decided. The wreck is regarded as waste and therefore, according to Italian law, the Tuscan Regional Administration is in charge of authorizing its transportation. a) Currently, traditional towing is considered the first option. b) With a US$ 30 million contract, Costa Crociere has also optioned the world’s largest semisubmergible ship, the Dockwise Vanguard, as an additional alternative. The Dockwise Vanguard offers two possible offloading methods for the Concordia: “float off”, which means that the wreck would be offloaded into the sea afloat, or “skid off”, whereby the Concordia would be transferred from the Dockwise Vanguard directly onto a pier or an adjacent quayside area. A decision on the offloading method will be made in due time, should this mode of transportation be required. The port that will accommodate the Concordia will need to have specific characteristics suitable for a wreck of this size (for example a 20 meter water depth in the port) and the necessary facilities for dismantling and recycling, in accordance with current national and international regulations and the highest environmental and safety standards. As with the selection of the companies responsible for the Concordia removal project, Costa Crociere has adopted a transparent process to select the organization/companies and facilities for the dismantling of the Concordia wreck once it is removed from Giglio Island, in agreement with the Italian authorities. A process has been arranged to choose the facility to dismantle and recycle the wreck using a method that offers the best solution in terms of certainty of outcome, environmental and workplace safety standards. The process is being handled by technical consultants, London Offshore Consultants (“LOC”), on behalf of Costa Crociere and its Underwriters. An expression of interest document was distributed on November 13, 2013 to over 30 companies and organizations considered potentially capable of dismantling and recycling the wreck. Each respondent was required to indicate its proposed locations. After preliminary screening of the replies, companies/organizations representing different countries such as Italy, France, Norway, UK and Turkey were considered suitable and were therefore invited to take part in the next step: submission of bids through a formal Invitation to Tender process. On December 17, 2013, on behalf of Costa Crociere and its Underwriters, London Offshore Consultants issued an Invitation to Tender to some of the companies or organizations who expressed an interest in the dismantling and recycling of the Concordia wreck. 3. protection of the environment and workplace safety. The Invitation to Tender was developed in accordance with national and international regulations and EU waste regulations in force, and inspired by the provisions of the newly approved EU regulation on ship dismantling, which recently entered into force. Each tenderer is therefore required to demonstrate, with full supporting information, that the facilities that it proposes to use for the dismantling and recycling operations have all the necessary authorizations and licenses required by international or national laws relating specifically to the dismantling or recycling of ships or by general waste legislation. Each tenderer is also required to demonstrate that the facilities that it proposes to use for the dismantling and recycling operations implement management systems, procedures and techniques which do not pose health risks to the workers concerned, nor environmental risks. Each tenderer is also required to present details on commercial terms of the proposal. The respondents’ offers will be analyzed in order to make the final selection and award the contract for dismantling and recycling, according to the terms and conditions included in the Invitation to Tender. This process is expected to be completed by the end of February-early March 2014. From the word go, the priority of the Concordia removal project has been to protect the environment of Isola del Giglio. This commitment will not end when the wreck is removed; on the contrary, it will continue long after with restoration of the seabed and ongoing monitoring for another five years after completion of the salvage operation. The environmental management project, comprising contributions from leading universities and research institutes, has been had positive results to date. The analysis conducted indicates that the state of the water at Isola del Giglio is good, in line with Tuscany’s territorial waters generally, and that no significant damage has been sustained by the marine ecosystem outside the area of the worksite. This assessment has been carried out not only by means of traditional testing, but also by using more sophisticated methods such as in-depth examination of mussels, sea urchins and fish species in the local area; these forms of marine life have been periodically sampled and found to be free of contamination once compared to their counterparts elsewhere along the coastline. Similarly, the sampling cycles carried out recently on the water inside the wreck have not given any particular cause for concern. Nevertheless, as a precautionary measure, so as to prevent any possible damage to the marine environment prior to the parbuckling about 4,000 cubic meters of water was pumped out of the wreck in way of the laundries and the store and provision rooms. At the same time, a great deal of attention has been paid to the sea bed not only on the worksite but all the way along the east coast of the island. Important flora and fauna like the Posidonia meadows and coral formations (habitats protected by the European Union) have been mapped and are continuously monitored to verify their state of health. To date, only in the area of the worksite have changes to the state of the sea bed been detected, whereas elsewhere there has been no sign of any alteration. Prior to the parbuckling operation, between the middle of August and the first week of September, to the removal of sediments that were identified in the area between the wreck and the coast for a total volume of about 2,500 cubic meters of water and sediments. Isola del Giglio is currently one of the most closely monitored areas anywhere in the Mediterranean. So as to ensure that the salvage project is carried out while minimizing the environmental impact, the different bodies charged with environmental supervision – both by the Observatory (ARPAT, Tuscan Regional Environmental Protection Agency and ISPRA, Higher Institute for Environmental Protection and Research) and by Costa Crociere (Università La Sapienza di Roma and the company D’Appolonia) – are conducting continual checks throughout the area in question. The monitoring not only addresses the impact of the operations on the marine environment, but also analyses the quality of the air and noise levels, and surveys the state of the island’s terrestrial (natural and architectural) heritage. UNIVERSITA’ LA SAPIENZA: 17,500 tests of the water inside and outside the hull (about 210 campionamenti su 82 parametri); 3,000 analises for ecotoxicology of waters, sediments and marine organisms. UNIGENOVA: 18.000 tests (circa 2,300 samples analyzing 6 chemical/physical parameters) of the water outside the hull, collected using a multi-parameter probe. More than 1,800,000 point data gathered on the condition of currents, 71 samples analyzed for sediment flows (approximately 6 samples per month); 54 mineralogical tests for a total of 648 minerals (12 minerals for each test). A Geologist has graduated and 2 other geologists and environmental expert are about to graduate with thesis relating to the Concordia monitoring. ARPAT: about 20,000 tests of parameters of the water outside the hull. Also, the entire worksite is monitored by ROV (Remote Operated Vehicle) cameras with underwater footage up to a depth of 80 meters. This initial stage was carried out from June through August 2012 with the objective of gathering useful information about the area where the wreck is lying, for the purpose of helping defining optimum project solutions as well as assessing the possible environmental impact of the salvage work and determining the best possible measures to reduce that impact. This preliminary investigation involved all aspects of the marine environment (physical, chemical and dynamic properties of the water, benthonic and plankton populations, Posidonia meadows, fish populations, underwater background noise, observation of marine mammals, etc.). Since the beginning of operations, sampling is conducted to test the different physical, chemical and biological properties of the marine environment. The results have enabled (and will continue to enable) constant monitoring of the environmental effects of all the work at the site, guaranteeing implementation of the corrective measures foreseen in the event that certain set limits are exceeded. The state of the currents, turbidity of the water and sedimentation are all analyzed. Underwater measurements are also conducted to determine the volume and intensity of noise caused by the work and by local shipping. In addition, the area is being monitored by whale watchers. Such monitoring, currently suspended, will resume with the beginning of operations for the installation of the sponsons on the wreck. Currently the definition of the sampling points for the monitoring of internal waters is also in progress, in cooperation with competent authorities. Additional investigation of the marine ecosystem (Posidonia meadows, coral formations, plankton and algal populations in the tidal zone) is also being carried out for the purpose of verifying the state of health of the local marine environment and providing guidance for any mitigation or environmental restoration measures. Subsequent to the removal of the wreck and in accordance with the results of the Underwater Baseline Survey, the other two stages will begin as follows. This stage involves all those measures required to restore the conditions that existed prior to the commencement of the wreck removal project. This monitoring is intended to determine the state of the environment upon conclusion of the work and in the long term (5 years) with special regard to those components that take longer to return to their original condition. The Underwater Baseline Survey revealed the high density of Pinna nobilis (aka “noble pen shells”) in the area where the salvage operation is being carried out. At the start of monitoring, divers identified the clams exposed to the greatest risk, around 200, and these were carefully removed from the sea bottom and later put in another location which, while near the wreck, is sheltered from the work, with a view to final “replanting” of the shellfish after completion of the recovery project. Monitoring of the marine environment also focuses on the Posidonia meadows and coral formations in the area, especially between the wreck and the coast, in order to detect any changes in their condition. A network of monitoring stations (“balise” transceivers) fixed to the sea bed combined with regular surveys by divers and ROVs means that the condition of the Posidonia (density, growth, etc.) is under constant observation. Apart from in the immediate area of the wreck and its shadow, where the Posidonia has been deprived of the light that is essential for its survival, this marine plant has not suffered any adverse effects at all. The protection of marine mammals is another question central to the project. Measurements by means of hydrophones are constantly made of the volume and intensity of noise caused by the work; if necessary, any operations which may disturb marine mammals can be reduced, modified or suspended. In and around the marine salvage site there are two expert whale watchers (MMOs - Marine Mammal Observers) working on board water craft. Thanks to this monitoring, on January 8, 2013 a dolphin was sighted in distress. The animal had its caudal peduncle tangled in a piece of netting and was unable to swim freely. The competent authorities were duly informed and, for three days off and on, the work site water craft interrupted or slowed down their movement so as not to cause any disturbance to the dolphin in difficulty and to help it find its way back to freedom. Monitoring of air quality has been conducted until December 10th with a dedicated monitoring station and has provided evidence that there was no effect on air quality even in periods in which the highest number of vessels were employed. Immediately after the accident Costa Crociere intervened to prevent the potential environmental impact by arranging barriers (absorbent materials) around the hull in case of any leakage or spills. On Saturday, January 14, 2012 the Company charged the world’s leading salvage experts Smit Salvage BV, who in turn worked with the Italian firm Tito Neri srl, with the task of devising a plan to pump fuel out of the ship in close consultation with the relevant authorities. The pumping of oil from the tanks duly began on February 12, 2012 and ended successfully on March 24, 2012. A total of 2,042.5 cubic meters of fuel was removed from the ship. On January 14, 2012, the recovery of material floating on the surface was begun by the emergency response services and continued subsequently by Costa Crociere. On March 13, 2012 the operation to remove the sewage ended, Smit Salvage BV and Tito Neri having recovered a total of 240 cubic meters. At the end of the debunkering, on March 25, 2012, the recovery of material deposited on the sea bed started and in total 24 tons were collected. On board the ship there are still mainly cleaning and hygiene products in small type-approved containers locked in store rooms. The Costa Concordia satisfies the highest environmental compliance standards and all potential pollutants are safely and correctly stored. Since the possibility of leakage is very remote, the removal of the products concerned from the wreck in situ would have brought more risks than benefits to the salvage operators. This has been reconfirmed also by the evaluations made after the rotation of the wreck, the so called parbuckling. The removal of the wreck of the Concordia is the most daunting salvage ever attempted on a ship of its size also in terms of the deployment of financial resources on an unprecedented scale. The project is funded entirely by the private sector and not one cent of public money is being spent. A study commissioned by Costa Crociere and conducted by Politecnico of Milan measured the economic impact of the Concordia salvage project and evaluated direct expenditure incurred by the Company (as at September 13, 2013), with a breakdown by country of origin of the different suppliers involved in the operation. It transpired that the project has been a great booster for the economy both locally and nationally. Italy has attracted the lion’s share of this stimulus, with almost 60% – approximately 261 million euros – of direct spending on the project. Italy is followed by the USA (20.86%), the UK (11.98%), the Netherlands (3.75%) and Germany (2.58%). It is estimated that the GDP generated by the recovery project in Italy is worth almost 540 million euros. This figure was calculated taking into account the direct impact, impact on allied industries, place of residence and transport. Therefore, the salvage operation has indeed been a great booster for the Italian economy both nationally and locally. 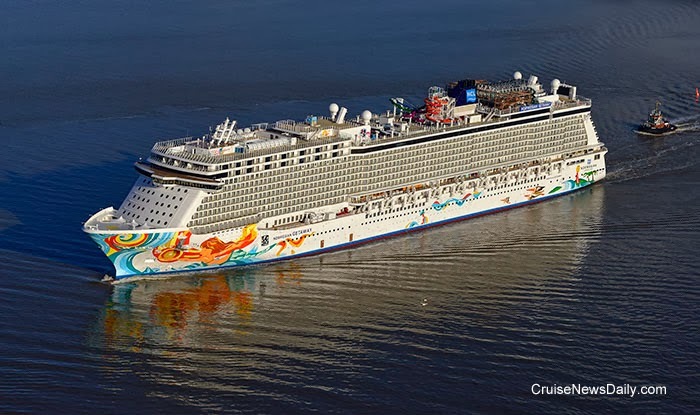 Norwegian Cruise Line took delivery of the 145,655-gross ton Norwegian Getaway this morning in Bremerhaven (Germany). The ship is the second of two Breakaway-class ships built for the line by Meyer Werft. 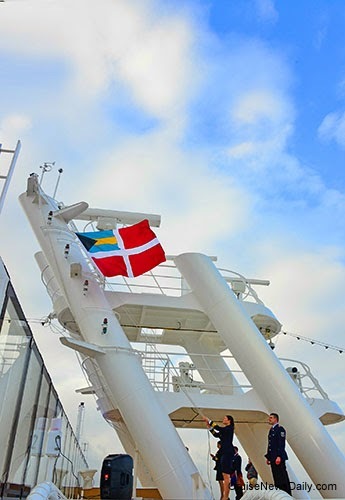 It is currently sailing to Rotterdam to begin its European inaugural activities. Norwegian Getaway will be christened in Miami on February 7. Photos courtesy of Meyer Werft. May not be copied or used without permission. All rights reserved. In case you might have forgotten, January 1, a new law went into effect at California ports that puts them on the road to all ships docking at all ports in the state having to use shore power, or until they get to that point, seriously reduce their air emissions while in port. January 1, 2014, began the first step, and it was a big one. The Port of Los Angeles says they were ready, and probably more ready than any other port in the state. Los Angeles has more berths equipped to provide short power than any other of California port. * Are You Ready for New Year’s Eve? No, this story isn’t running late. You have to make your reservations early to get into the best places on New Year’s Eve, and Crystal Cruises has already made theirs for next New Year’s Eve - and it is a truly spectacular place they’ve reserved to ring in 2015. Cunard's commemoration of the tenth anniversary of Queen Mary 2 continues to May when there will be two special transatlantic crossings. A special speaker aboard both will be Stephen Payne OBE, who was largely responsible for the overall design of the ship. Cunard has released the interesting video below of Payne speaking about his design and the building of the ship. Genoa, January 9, 2014 - Costa Crociere is pleased to announce that it has created, as of January 1, 2014, a new position in its top management structure, appointing Paul Soulsby as Senior Vice President Shared Services. In this position he will report directly to Michael Thamm, CEO of Costa Crociere S.p.A.
“I am certain that Paul’s experience and knowledge of our company and our business will allow him to successfully undertake this very important assignment in Costa - commented Costa Crociere S.p.A. CEO Michael Thamm - He will make a substantial contribution to further strengthen our business structure, developing synergies between common practices of the main staff functions." Paul Soulsby was born in Great Britain in 1960. After qualifying as a Chartered Accountant in 1985 he began his professional career as Audit Manager at KPMG Peat Marwick in Belgium, before serving as European Finance Manager at P&O Containers B.V. from 1992 to 1995. Further appointments included that of West Mediterranean Financial Controller at P&O Nedlloyd Srl as well as Director of Finance and Controlling of Minit Service GmbH in Frankfurt and Düsseldorf. In September 2001 Paul Soulsby took up the position of Finance Director at AIDA Cruises. In 2004 he was appointed to the Executive Committee of AIDA Cruises as Senior Vice President & CFO. In this capacity Mr. Soulsby led the finance function as AIDA increased its capacity from 1,180 berths to 18,600 berths. 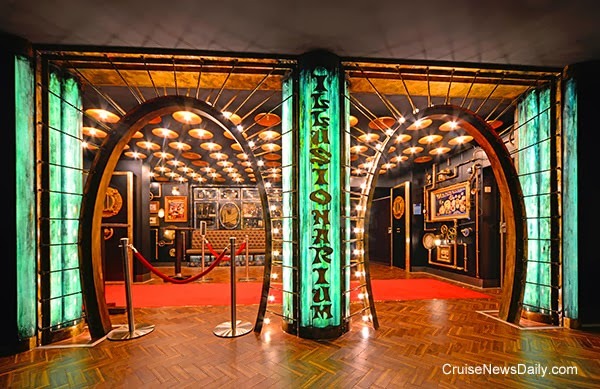 One of Norwegian Cruise Line’s most popular entertainment acts just passed a milestone last week, and to celebrate Norwegian is giving them to opportunity to pass many more. Legends in Concert was one of the original acts to sail aboard Norwegian Epic, and they’ve never left. Last Friday, they celebrated their 1,000th performance aboard the ship. Grand Princess and Star Princess were released from the search this afternoon for the crew member who appears to have intentionally gone overboard late Monday night from Grand Princess while it was sailing from San Francisco to Hawaii. Both ships have now resumed their journeys to Hawaii, and the Coast Guard has suspended its search. The search was unsuccessful. Cunard is celebrating the tenth anniversary of the christening of Queen Mary 2 today (January 8). Part of that celebration is the release of an entertaining tribute video that's not quite what you would expect from Cunard. Enjoy it below. After 16 years with the company in a bevy of key leadership positions, Pier Luigi Foschi is retiring from all his current positions with Carnival Corp. In his current position of CEO of Carnival Asia he has been shaping Carnival’s future in the exploding Asian markets that will probably be responsible for much of the company’s growth in the coming years. It has happened yet again. Another person has gone overboard, this time from Grand Princess as it was sailing from San Francisco to Hawaii. Carnival Cruise Lines has partnered with Sun and Skin Care Research to provide passengers with the company’s Ocean Potion sunscreen while aboard four of the line’s ships in a pilot project. The SPF 30 sunscreen will be distributed to passengers where they need it: at the ship’s pool areas and as they go ashore. Another passenger, again Canadian, has gone overboard from a cruise ship last week. This passenger, an 88-year-old woman, went overboard from a stateroom balcony on Holland America’s Veendam about 1pm Friday afternoon (January 3) when Veendam was approximately 280 miles southwest of San Diego. CND subscribers also read about a project now rushing to completion ... and the latest construction photo (below) of Quantum of the Seas taken this morning at Meyer Werft in Papenburg. Photo courtesy of Meyer Werft. May not be copied or used without permission. All rights reserved. In what seems like a natural alliance (and why didn't somebody do this before), Carnival Cruise Lines has partnered with Sun & Skin Care Research, the manufacturers of Ocean Potion sunscreen, to distribute the product on four of their ships beginning next week.